To celebrate the launch of the new third generation Yaris, Toyota Ireland kicked off a promotion this week on its Facebook page, which will see the company give away €25,000 in cash and prizes over the next month. As part of the ‘Fit More In’ campaign which showcases the Yaris’ array of features and increased interior space, the Facebook promotion features daily prizes of €10 iTunes vouchers, cash prizes, and a grand cash prize of €5,000 for one winner. To enter the competition, participants log on to Toyota’s Facebook page, ‘like’ it, and go to the ‘Fit More In’ promotion tab, where they can mouse-over an image of the Yaris and find the daily ‘sweet spot’ to be entered into the daily prize draw. ‘Sweet spots’ are related to key features of the Yaris and could include anything from its heated mirrors and alloy-wheels to its follow me home headlights and touch screen console. 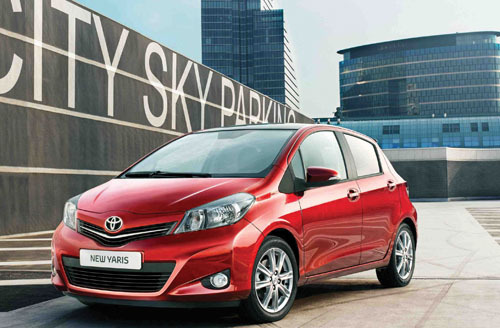 The new third generation Yaris has made significant leaps forward from its predecessor, providing an even more spacious interior and bigger boot space, a clear step-up in what Toyota describes as sensory quality and a segment breakthrough in affordable multimedia connectivity. Available from €14,760 ex-works and across three specification levels (Terra, Luna, Sol ), the new Yaris offers electric power steering, seven airbags, vehicle stability control (VSC ), traction control, electronic brakeforce distribution and break assist as standard on all models.